Today’s guest is going to share her true experiences with blogging, tech stuff, and coding. She’s been a blogger for over 5 years, has opened up a business built around words, and is one of the most amazing women I know… even though she is not a techie! I hope you enjoy reading her story. I didn’t know much when I first started blogging. In fact, back in January 2013, I didn’t even know what blogging was! I also didn’t own a good working computer back then, either! But I bought a brand-new laptop and had my sister help me set it all up. I’m not very technically adept, and I needed help with even the basic stuff. My sister has owned many computers and laptops, so she showed me how to get my new laptop up and running, including how to password-protect it. Once my laptop was set up, I set up an email account, then joined Facebook and Twitter. I then spent four days watching blogging tutorials on WordPress.com, making notes as I went through the videos. I felt like I was back in school. I have always been a good independent learner, and so I was able to teach myself many things by reading and watching videos. Although I’m not a “techie,” I was able to follow simple, step-by-step instructions and set up a free blog using the email address I created. I chose a theme that appealed to me and then I wrote my first blog post. I started blogging as a way of “getting my name out there” because I wanted to be an author and the book I had bought said that authors were now expected to promote their works through blogging and social media. The book I am referring to is The Writer’s Market 2013. I had purchased previous editions of this book, but this 2013 edition was the first one to mention blogging. How I Became a Better Blogger? Because blogging was new to me – and because I wanted to be the best blogger I could be – I started reading blogs about blogging. I read articles on Problogger. I read articles on Dear Blogger. I learned about SEO because I read blogs about SEO. I threw myself wholeheartedly into learning about everything that was blogging-related. I did the same with social media. I encountered many problems during my blogging journey. When I read others’ posts, I saw them do some neat things, and I wanted to do the same things on my blog posts. Four examples include using Click to Tweet links, highlighting text (as though someone took a yellow highlighter to it), creating colorful boxes around paragraphs of text, and using clickable links called “page jumps” to move from one section of the blog post to another really quickly (these are often used in guides). I also didn’t know how to make my site load faster. To learn know how to create “Click to Tweet” links in my blog posts, I asked other bloggers for help. Only one tried to help me – Ana Hoffman. The problem is that, when you’re blogging on a free platform such as WordPress.com, you cannot install plugins on your site because your site is not really yours! It’s only when you move to a self-hosted site that you have such freedoms! I found a workaround solution, however, and wrote the following post as a result: How to Use “Click-to-Tweet” Links in Your Blog Posts. (I would later add other solutions to this post, updating it as I found them.) I even credited Ana Hoffman in that post and provided a link to the Google Plus post where she actually tried to help me find the solution. HTML is a form of “code.” It is the language that is understood by computers and techie people (but not me). This type of code can be seen in the Text Editor (not the Visual Editor) of WordPress CMS (Content Management System). I’m sure it can be found in other places, but I’m not sure where. Like I said, I’m not very techie! But still, I am trying to share some techie tips. Anyway, Greg taught me a few tricks involving code so I am now able to highlight text in my blog post and even use colorful boxes around parts of my text! The blog post How to Highlight Text in Your Blog Posts: 4 Easy Methods (#Tutorial) will help you learn how to highlight text. To change the color of the box, replace the hex value (e3f7fa) with a different one, using a Hex Color Generator. To make the border thicker, replace the 1px with 2px (or another number). Play around with the numbers and have fun making your blog posts awesome! To learn how to create page jumps, I searched Google. Although I read a few different articles on how to create them, I found them all very confusing and hard to understand. So I wrote my own article about page jumps! I then used it as a guest post (actually, I think I was paid for that post because Greg became my first freelancing client) on Dear Blogger. The post All about PAGE JUMPS will teach you how to make page jumps. “Page jumps are special links that you can create to move from one point to another within a blog post, an email newsletter, or a blogging guide. Sometimes they are called internal links. Page jumps are most often used in long articles found on the internet and allow people to access information faster. Instead of scrolling down on the page, which can take many seconds or even minutes, a simple page jump link can be clicked, allowing for instant navigation. In today’s world, where this type of gratification is desired by busy people who don’t have time to waste, page jumps are a fantastic solution, and are welcomed by many! After a year of blogging (and writing for Greg from Dear Blogger), I moved my free site to a self-hosted one. I imported all of my posts. I installed plugins. I was doing great! I also wanted to monetize my blog with AdSense. Plus, I opened my own business, Wording Well. At that time, back in 2014, And the freelancing services I offered were writing and editing. (I’m an English teacher by trade, and GREAT with words!) After I became an author, I added Author Assistant services to my business. Time passed, and then my website suddenly slowed down and I started having a few other technical problems. I still don’t know to fix certain issues with my website. To make it load faster, I hired someone to improve things for me. To fix the errors I learned about when I checked stuff via my Google Console, I had a techie friend who fixes things for me. The thing with blogging is that you can never do it all yourself. But the good thing is that others are there to help! I like to help bloggers. I even created a free e-book to give away! Pick up your copy of 20 Blog Post Must-Haves today! Lorraine Reguly, B.A./B.Ed., is an author and English teacher-turned-freelancer for hire. Her life journey is motivational and inspirational. Lorraine's book, From Nope to Hope, is a self-help book designed to help anyone who wishes to lead a happier life and contains a built-in workbook. Lorraine offers 4 different services on Wording Well, including writing/blogging, and editing. She also helps others become published authors! Check out her services and see what she can do for YOU. I’m still not techie, and I still need help managing certain technological aspects of my website (like being able to speed up the loading times), but I certainly have come a long way! I hope my tips help your readers learn a few tricks too. Thanks for allowing me to share some of my experiences with blogging here, on your site. You are more than welcome to write on my Blog. And I am sure that my readers are going to love your post. Great post from a non-techie blogger. Basically, Bloggers from any criteria can inspire and help with tips from their experiance to the others. It is not must to be on the same topic. This is great. Thank you. That’s the wonderful thing about blogging. Bloggers are very helpful people and will share their experiences with everyone without expecting anything in return! It’s indeed a great joy to see our common friend Lorraine on your page as a guest author. It’s really good to read such amazing tech-tips from a non-techie. The shared tips are worth notable. Thanks Lorraine for sharing your personal experiences too. Though I know you for some time now it is really good to know some more valuable things about you and your writings. Wish you all the best for your future endeavors. Hi, Phillip. Thanks for stopping by to read my post on Robin’s blog. Yes, we have been fellow bloggers for a very long time. And I appreciate you visiting and commenting! Which of my techie tricks did you like best? First, I’d like to congratulate you on making the wise decision to become a blogger. Just like you, when I first started blogging, I had no clue about anything. I did not even know what a domain name was or what blogging really was. I was a complete newbie. One thing that gave me the advantage, though, was the fact that I was not very techie challenged. I already knew HTML coding and had experienced with computers. My father is a computer engineer, so I grew up around computers all my life and knew my way around the operating systems. 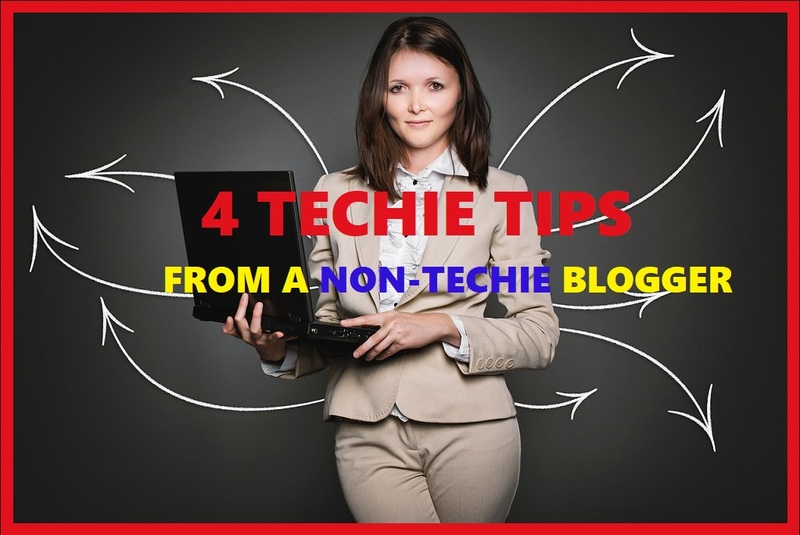 It can become challenging for new bloggers to deal with these techie things, that is why it is good to learn and share to help out others who are in the same shoes. Freddy, you are lucky. My family never had a computer… EVER! But I know what you mean about being a newbie. It’s tough to realize how much time blogging and promoting your posts really takes! SEO, image creation, image compression, email list building, etc. I am glad you commented. It shows other bloggers we are in this together!